and skilled home improvement Pro. Being Bonded proves it to the world. But your new clients will. Trust isn't what it used to be in the world, and homeowners know it. That's why trustworthy renovators and tradespeople are becoming Verified and Bonded by eRenovate™. It's Canada's most demanding verification program for our industry, and its the only one that stands behind your work. No business can just pay their way onto eRenovate as with other programs. with homeowners ready to trust you! Are you tired of competing with contractors who don't care about their work? Fed up bidding against tradespeople who don't care about insurance, licenses or honesty? Leave the cowboys behind and reach clients who value your professionalism. That's what eRenovate can do for you. Apply online, prove you're one of the good guys, then homeowners looking for real pros contact you directly on your smartphone. Send them a bid, and seal the deal. Watch How eRenovate Works. Show Your City How Good You Are. It's not enough to do good work these days. You need to show what you can do. eRenovate makes this possible like nothing else can. It gives you the power to upload images, video, testimonials and previous project descriptions. Only Insured Pros: We check and verify that each pro carries full liability insurance. 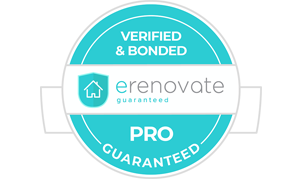 Fully licensed: Every eRenovate pro has shown us their licenses. Reputable Pros Survive: We require that contractors have at least a 3 year track record. Workers' Safety Insurance: We check and verify WSIB coverage and keep records on file. Verified contractors treat workers fairly. Code of Conduct Our contractors sign and commit to the eRenovate Code of Conduct and they're proud to honour it! YOU SPEND A TONNE OF MONEY ON ADVERTISTING. Reach new customers who are ready to hire. Become Verified, get eRenovate working for your business. 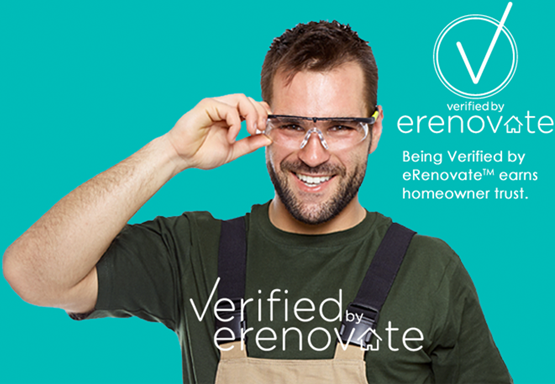 Homeowners and Pros trust the Verified by eRenovate™ seals because of what it stands for. They feel comfortable about the contractor they are hiring. 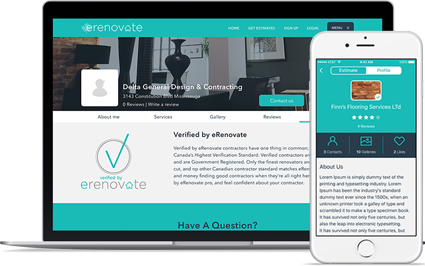 Verified Pros are contractors you can count on and eRenovate is the only place to find them. Only the finest Pros make the cut. Stand out today!